I'm not. I honestly don't think I could ever be cookied out. I just love cookies way too much. When I was little my mom used to call me the cookie monster. I guess I never grew out of it. I think cookies are also good to have around when you have guests and they are perfect for a party. Some desserts are too intimidating and people will be less likely to try them. But have you ever met somebody who is intimidated by a cookie? Nope, me neither. 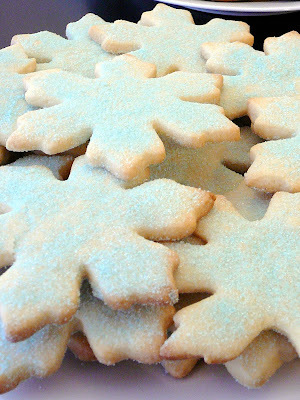 As for these sugar cookies, they are simple, classic, and delicious. 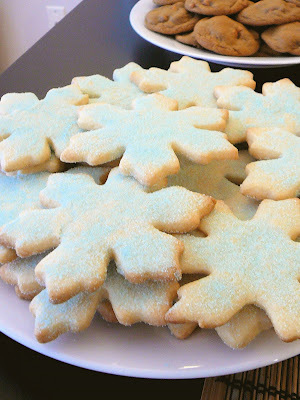 If you are feeling ambitious you can pipe fancy decorations for your cookies, or you can take the easy way out like me and dust them with a little sanding sugar. I made this baby blue sugar by putting 1/4 cup of sugar in a zip lock bag with a few drops of blue food coloring. All you have to do is shake and squish it around until it is evenly blended. Mix together the flour, baking powder, and salt, set aside. In a large bowl, beat together the butter and sugar until light and fluffy. Beat in the eggs one at a time, then stir in the vanilla. Slowly beat in the flour mixture until fully absorbed. Separate dough into two disks, wrap in plastic wrap, and refrigerate for a minimum of 2 hours or overnight. Some people love eggnog, others hate it. I am one of those people that love it. As a result of my love of the creamy nog, I knew I wanted to make a cookie that would capture the essence of this holiday drink. 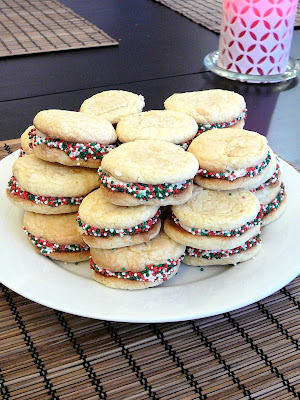 If you remember the lemon sandwich cookies I made this past summer, I thought they were a good starting point. I used a white cake mix to make the cookies and then made my own eggnog buttercream. If you share the love of eggnog like I do, then you should try these. Preheat oven to 375 degrees F (190 degrees C). Pour cake mix into a large bowl. Stir in eggs, oils, vanilla extract, nutmeg and eggnog until blended. 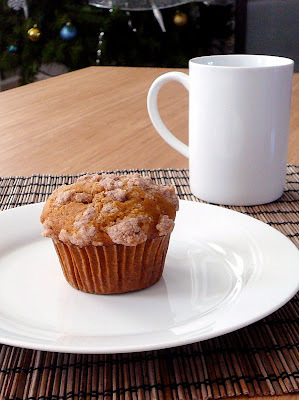 If mixture is very wet slowly add 1/4 to 1/2 cup of flour until the dough comes together. Cream butter, vanilla extract, and rum flavoring. Slowly beat in powdered sugar. Add 2 tablespoons of eggnog and beat until fluffy, adding more if needed. Frost the flat side of the cookie. Lightly place the flat side of an unfrosted cookie on top. Press down until a bit of the frosting begins to poke out of the sides. 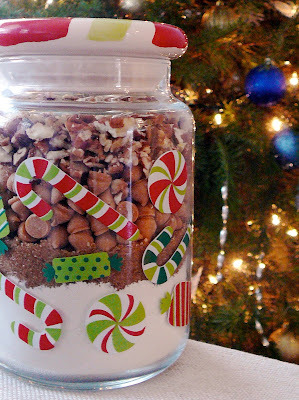 If you want to decorate the edges, place your sprinkles/chips/etc. in a small bowl, and dip the sides of the cookie in it, rolling the cookie around to coat all sides. About a month ago somebody at work offered me a Gingerbread Butterscotch Cookie. I was not going to have one because I was actually trying to make better food choices, but I did not want to be rude and I really wanted to taste the cookie :) I was surprised by how much I loved the cookie. 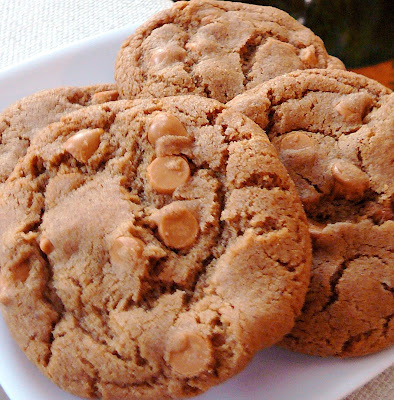 I don't know about you, but I had never tried gingerbread and butterscotch together. Let me tell you they are amazing together!!! 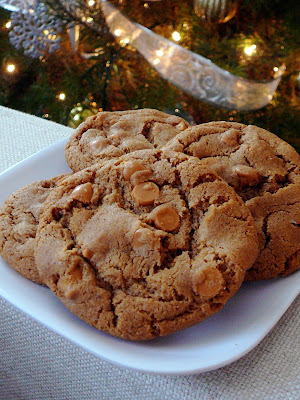 They definitely have the Christmas feel with the spice of the Gingerbread, but they are a chewy cookie with the sweetness of butterscotch. 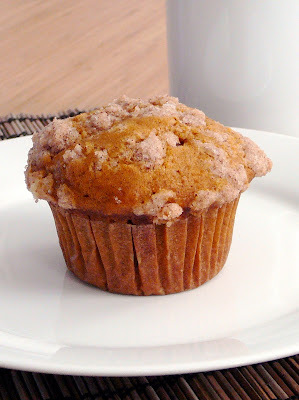 If you are snowed in today (like me) you should go make these. Awesome truffles! They look like they'd be the hit of a holiday party!